The pale green flowers of Asclepias hirtella form "globoid umbels" reminiscent of fireworks exploding. Close examination of the flowers yields tinges of white and purple. Bees and wasps are the main pollinators; but butterflies, moths, and beetles will also visit in search of nectar. Monarch butterfly caterpillars will not be disappointed in Tall Green Milkweed as it has ample foliage when monarchs are present. 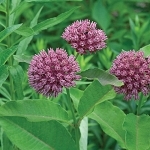 While some milkweeds, such as common (A. syriaca) and whorled (A. verticillata), spread underground to form large colonies, tall green milkweed has a taproot and only spreads when its seed lands in just the right spot. The right spot for this wildflower is sunny and well-drained.